Let our mattress size guide help you make an informed decision! 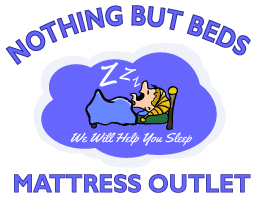 Nothing But Beds Mattress Outlet proudly serving the Tri-State since 2001. We offer a wide range of beds for sale from mattress king, mattress queen, mattress twin, mattress memory foam, mattress kingboxtop, firm, extra firm, plush and pillow-tops. We carry brand new direct from the factory. So we can offer you the best price, since we BUYDIRECT. If you prefer more living space in your master bedroom, a queen size might be what you are looking for. Also, queen mattresses are ideal for someone who likes additional width and height while sleeping; which makes it a great choice for growing children and taller adults. Comments: Best selection for two adults but possibly too small for some. If you have the space in your bedroom, a king size mattress is the best choice for couples; you each have a sleeping service equivalent to a twin extra long mattress. It is also great for growing families or pet owners. WE OFFER WIDE SELECTION OF TOP COMFORT LEVELS FOR MATTRESSES Nothing But Beds Mattress Outlet proudly serving the Tri-State since 2001. We offer a wide range of beds for sale from mattress king, mattress queen, mattress twin, mattress memory foam, mattress kingboxtop, firm, extra firm, plush and pillow-tops. We carry brand new direct from the factory. So we can offer you the best price, since we BUY DIRECT. Firm mattresses offer the least surface “give” and would be considered harder in feel to the other mattress surfaces. If you like a solid feel rather than soft, firm may be your choice.